Bicyclists in San Francisco's The Wiggle area question the need for cyclists to stop at all stop signs. Stop signs can pose a major momentum drain for cyclists. The effort required to slow, come to a complete stop, and then get moving again is substantial. It’s so substantial that some cyclists don’t bother. Instead they coast up to the sign, scan the road, and roll through when the intersection is clear. That, says Morgan Fitzgibbons, is exactly as it should be. Fitzgibbons helped to organize a “stop-in” demonstration in a popular biking neighborhood in San Francisco. The area, dubbed The Wiggle because of the circuitous, zig-zagging route cyclists take through side streets to avoid a major hill, saw cyclists strictly adhering to the law. Lining up single file, they took turns halting completely at each stop. The result was a significant cramp in the rush-hour commute. “It took about 15 minutes to go two blocks,” Fitzgibbons estimated. The protest was orchestrated by a neighborhood organization called The Wigg Party. It was held in response to Park Station Police Captain John Sanford’s announcement that officers would begin cracking down on cyclists failing to stop at signs. The initiative was part of a broader campaign to address an alarmingly high pedestrian fatality rate in the city. Under the Focus on the Five campaign, police aim to cite the five behaviors that contribute to the greatest number of collisions: speeding, running red lights, failing to yield, making unsafe turns, and running stop signs. He is advocating for a change in San Francisco law that would allow cyclists to treat stop signs as yield signs. “If there are people with the right of way, then you absolutely stop, but if no one is there, or you have the right of way, you shouldn’t have to stop.” It’s a law that has been on the books in Idaho for decades. The Idaho Stop Law, introduced in 1982, allows cyclists in the state to approach an intersection, scan for other road users, and proceed if no one else has the right of way. It also allows cyclists to treat red lights as stop signs. The year after the law was introduced, bike injuries went down by nearly 15 percent. “It’s a total common sense law,” says Fitzgibbons, who hopes it will eventually be adopted statewide. 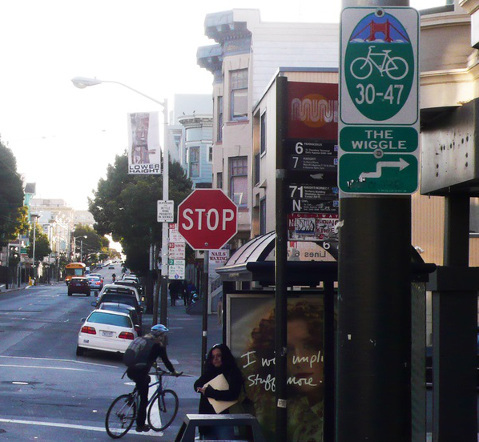 Whether San Francisco begins allowing cyclists to yield at stops remains to be seen, but The Wigg party made major waves with its protest, and it seems to have gained some ground. At a packed community meeting this month, Catp. Sanford announced that he would be putting the bike enforcement crackdown on hold, and he made plans to start biking through the neighborhood.